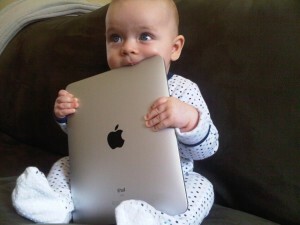 Home » ipad » Are IPads Bad For Children? Are IPads Bad For Children?. There has been a growing debate recently on whether iPads should be given to children to play with. Can they benefit children during their crucial development years or are they actually harmful? iPads present a wide range of advantages for children, however the ipad disadvantages must also be considered as social and interpersonal skills are said to be placed at risk. Past generations played outdoors with local friends, rode their bicycles in the streets, went to the park and played together and generally enjoyed the company of friends after school, a basic freedom which has sadly been lost in the modern world. When current generations of children head home after school they are most likely to be found in front of the television or on the iPad or computer. Things have certainly changed, however is it a case that we have to move on with the times? Modern life with its speeding cars and busy roads and our fear of our children’s safety playing in the streets unsupervised has put an end to the previously ‘free’ days past generations enjoyed. iPads have taken the world by storm and in fact, they come with some benefits when used by children. Over 70% of parents feel that iPads are beneficial tools in their child’s development. Often these gadgets can be used as educational toys, teaching children to read, write and count. They also provide a welcome break for parents as children become engulfed and mesmerized by the wide range of apps and games. Downloading a child’s book to the iPad can become an interactive experience complete with noises, explanations and movements. They are also linked to the improvement of eye-hand co-ordination. They are believed to have been the most popular children’s toy of 2012. Interaction with others is essential for socialization and for teaching children how to forge new relationships. Friends are an important aspect of any child’s life, they are foundations for the future, teaching them how to interact, how to share and most importantly, learn how to communicate effectively. Children spend less and less time outdoors playing classic outdoor sports, fear of safety can be to blame for this, but the worry is they risk becoming secluded and unfit, and become reliant upon technology. Outdoor play should be a staple in every child’s development, for fitness, fresh air, and physical development, this is often swapped for the more favorable iPad. Children require the skills to interact with others, to learn to be sociable with other children and learn how to share, how to play and how to generally be around other children, this is basic human behavior learnt through actual interaction with others, through real not virtual play. Sociability is an important stepping stone in our lives which is not learnt through use of the iPad. While children can of course communicate through gaming and social media in later years, will our future generations develop the fundamental skills required when they become adults within social and work situations? It’s important to consider the future impact of iPads on our children. Already over 20% of children own an iPad or tablet, this will continue to grow exponentially in the next few years. There is some belief iPad use can lead to attention deficit disorder, though this has not be proven as of yet. While it may improve hand- eye co-ordination, will it affect the way our children communicate when they get older? Will they have the ability to socialize face to face or are we setting them up for an insular virtual existence of social media and computers? These are all serious questions that we need to consider. When sitting in front of a computer screen all day or using an iPad, it is easy to become engrossed in the experience and become removed from real life around you. Are children missing out on these small important family interactions while their attention glued to a screen? Of course this remains an open debate. iPads are relatively new on the market and the result of their use within childhood will not be seen for many more years to come. Childhood is an important time for children to develop skills, this we know for sure. While iPads provide parents with a great tool in which to teach their children new skills in a more appealing manor, it is also imperative children are provided with genuine social activities, outdoor play with friends and family, and learn skills from a wide range of activities. Instead of debating whether iPads are good or bad for children, perhaps we should actually worry more about providing them with well rounded childhood where they can try and learn in moderation from everything available. It is amount of the time iPads are used by children, not the use of them at all which should be questioned. About the author: Kirstie works with letterbox.co.uk, a company which provide a wide range of indoor and outdoor games for children of all ages.